Depression is depleting and exhausting, but if confronted, one can have a fulfilling and uplifted life. Please read on…. The early morning is etched, a Friday, decades ago. My daughters, now with families of their own, were ages three and six. I was in bed; my husband was not home; and my younger daughter cried for me to come to her. Feeling as if a terrifying weight had descended upon my entire body, I struggled to breathe, and I could not move my legs. Regardless of how hard I tried, I could not leave my bed. I knew I was not physically ill — I understood that my body was reacting to crushed dreams and a broken heart. Reaching for the phone next to my bed, I dialed a number I did not know I even remembered. The number belonged to the psychiatrist who directed a large teaching psychiatric hospital where I had worked while pregnant with my older daughter. A kind voice responded. I said I was ill and in trouble. An appointment was made for an office visit the following day, Saturday, at 11:20 a.m. The next morning at 9 a.m., my husband took our daughters out. At 10:30 a.m., as I was preparing to leave for my appointment, the doorbell rang. My little girls were with a woman I barely knew. She told me that there had been an automobile accident. Our car had been totaled, but my husband and daughters were not injured. She gave me my husband’s instructions before her immediate departure: I was to cancel my appointment and remain “right where you are” until his return. Shaking and knowing I desperately needed help and counsel, I hugged and calmed my daughters, and read them a favorite book. I had no family to turn to, and tried unsuccessfully to reach a couple of friends. Then I took my daughters to their playroom, bringing milk and cookies with me. I drew a picture of a clock and said that by the time the real clock on a table near them looked like the drawn one, I would be home. I showed my older daughter how to dial O for Operator if anything frightened her. We practiced what she would say, and her ability to share our address. And then, Yes, I needed help so badly, and was so terrified, that I left two little girls alone at home for two hours. This incident was the prelude to my receiving the support, insight, and direction I needed to leave a marriage that would have continued to make me ill. After a brief period as a single parent, I remarried happily, a marriage now in its 37th year. There are many as fortunate as I who successfully confront isolation and terror through various forms of psychotherapy, receive much needed help, and find what I define as a reliable “emotional sense of direction.” Often I have described depression to clients (and others) as “a special color purple,” which when eased is transformed to strength by bringing insight into oneself, others — the human condition. However, this said, there are those who cannot afford quality help, and there are those whose painful struggle does not improve with therapy. These realities led me to believe that a highly structured resource much like AA available for those facing clinical depression would bring an urgently needed resource into our communities. Here evidence based psychoeducational coping skills could be introduced, and attendees could experience support and kindness in a trusting and welcoming setting where confidentiality was honored. This type of quality resource could compliment psychotherapy as well as be available to the countless Americans who do not have access to anti-depressant medication or psychotherapy. 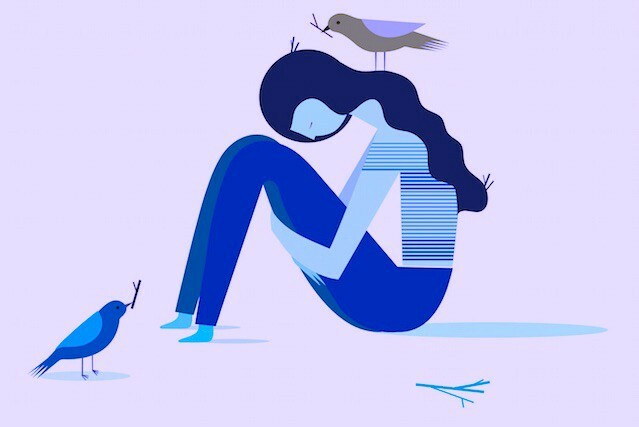 In the United States over 50% of the 16 million adults who are currently living with the depleting symptoms of clinical depression are not receiving any specific treatment. Enter Stefanie Glick, a woman who not only shared my vision to provide this much-needed resource, but who was already working to make it a reality. Drawing on a diverse professional career that spans over twenty-five years, as well as her personal experiences of living well with depression, Stefanie recently co-founded and leads the Philadelphia based 501C3 LiveWell Foundation to ensure that those who suffer, usually quietly, but always profoundly, have equal access to available information and support. Turning her passion for creating research-based experiential learning programs and fostering meaningful relationships through psychosocial education, Stefanie has created the LiveWell program, a free resource for those determined to live well, despite their depression. Following ten LiveWell Lifestyle Strategies for Managing Depression — a set of self-care strategies to help people monitor and manage symptoms of depression — Stefanie has recently begun to offer her expertise locally at weekly well-attended meetings, which, like AA, are free of charge, and is working toward expanding this service in Philadelphia and beyond. If you are suffering from depression, please look for a resource to help you. A trusted health care professional can guide you, as can a friend or colleague who has received this kind of help. When seeking a professional, request a brief period on the phone with a live voice and person to see if you feel a connection. Also, do visit the website of the LiveWell Foundation (https://www.livewell-foundation.org/our-program). Your comments are welcome. For full disclosure, I have joined their Board, as I deeply believe in the necessity of the quality of psychosocial education offered.